Chelsea Luna: Pre-Order A Forest of Wolves Now! 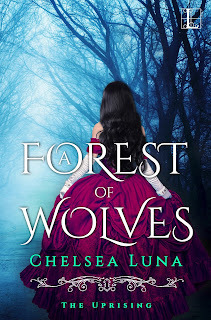 Pre-Order A Forest of Wolves Now! A Forest of Wolves (The Uprising, Book 2) is available for Pre-order before its September 13th launch date! Click here to purchase your copy! In a few short weeks seventeen-year-old Mila has gone from being Ludmila Novakova, pampered daughter of the High Chancellor of Bohemia, to becoming a traitor escaping the palace at midnight in her wedding nightgown. Her country is in chaos, an army is marching from Austria, and revolution is a breath away. Mila is caught in the middle, between the man she loves-Marc, the son of a blacksmith and a leader of the rebellion-and the murderer the Church calls her husband. Even as she flees with Marc into the heart of the resistance, where the suspicions of angry citizens make her every palace-born habit a danger, she knows he hasn't told her everything. But Mila is keeping the biggest secret herself: she is the heir to the throne, the daughter of embattled King Rudolf and Princess of Bohemia. The truth will turn the fury of both sides against her, leaving Mila alone to win her country's freedom-and her own . . . The story of Mila sounds quite interesting, i am looking forward to read it very soon. i will surely recommend this to my friends. Forest Fond’i ajalugu ulatub 2009. aastasse, mil ettevõte hakkas Eestis tegelema metsakinnistute ostmisega. Forest Fond laiendas oma tegevust 2013. aastal, kui hakati ostma ka põllumaid. Tegemist on Eesti erakapitalil põhineva ettevõttega, mille eesmärk on varuda ja hallata metsa- ja põllumaad. Forest Fond ei tegele ostetud maade edasimüügiga, vaid aitab suurematel Eesti maaomanikel, ettevõtetel ja fondidel hallata nende metsamajandust paremini, olles hea partner kõigile oma koostööpartneritele.